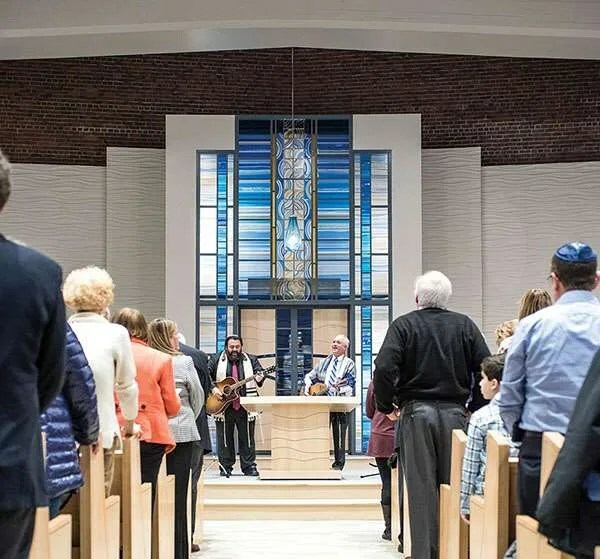 MARBLEHEAD – When Rabbi David J. Meyer stood on the bimah facing a packed congregation at the Temple Emanu-El rededication ceremony on March 8, he felt like a moment of fulfillment was being shared with the entire North Shore Jewish community. The lights came up in the newly renovated sanctuary, with its magnificent stained glass ark, and he could hear gasps of amazement. “I felt enormous gratitude for the blessings filling the moment,” he said. Ingrid Pichler, the Swamp­scott artist who created the ark, was among the attendees at the Shabbat service who witnessed the Torahs being placed in their new illuminated home. The renovation was a long road that started with discussions five years ago, as both the need and desire to update the sanctuary, social spaces, offices, and learning spaces became ever more compelling. The $1.8 million project, which addressed accessibility and inclusion, functionality, security, and the environment, also stressed artistic considerations, which is immediately evident upon entering the remodeled sanctuary. During discussions of how to best capture the essence of their community, Temple Emanu-El members kept coming back to the idea of water. 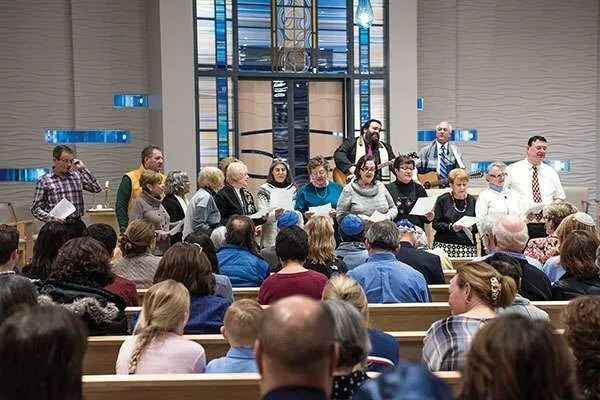 “It is fitting, especially for our synagogue which stands only steps from the Atlantic Ocean, that water is used as a visual theme for our sanctuary of worship,” Rabbi Meyer said in a statement last year. Pichler was first contacted by Francine Goldstein, Renovation Committee chairwoman, who asked if she would be interested in submitting a proposal for the ark as part of a national search for artists. The only direction she received was that the theme was water and she had one week to come up with something. There were no initial guidelines regarding color, shape, or content, which left it up to the artists to find their own interpretations and relationships with the theme of water and the architectural space. The committee also considered using mosaic, metal, and wood. Pichler presented her preliminary designs, and Goldstein recalled overwhelming committee support for using glass as the medium to express the theme. “The flowiness of the glass really speaks to the whole idea of water without being too blatant,” she said. Pichler received the green light to meet with the design team and submitted her first designs in February 2018. After a lengthy period of discussion and tweaking, the final design was approved last May. “Any site-specific installation has to successfully integrate the architectural space; honor the location, purpose, and light of that space and, in this case, be the focal point,” Pichler said. 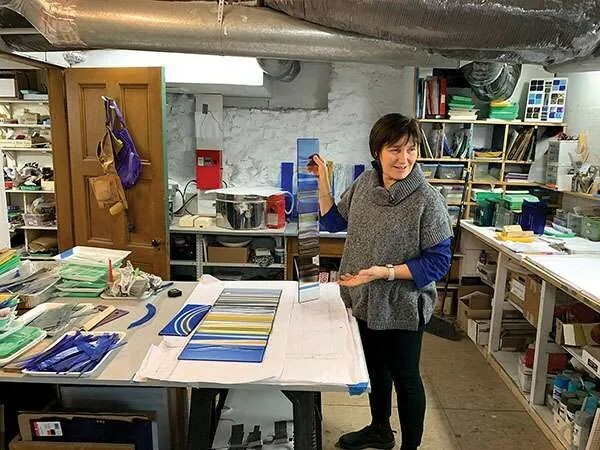 Pichler admitted she was a bit apprehensive at first, since this was her first Jewish house of worship (she has created work for churches in the United Kingdom and Marblehead). However, as a visual artist working in glass, she reminded herself that she communicates through more than just words. “The language of color, shape, texture, line, and light is universal,” she said. Originally from northern Italy, Pichler has been working in architectural glass for almost 30 years. She cut, shaped, assembled, and fired each one of the several thousand pieces of glass for the ark. The stunning result evokes the ocean, waves, and flow of the tides with its hues of blues and refraction of light, accomplishing much more than just its functional goal. “In the Torah, water is the primordial substance from which life emerged at the will of God,” said Rabbi Meyer.